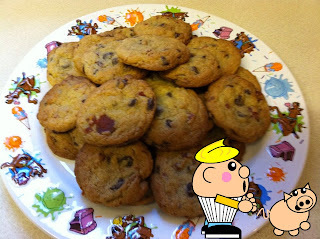 Inspired by an episode of Ace of Cakes (on Food Network – best channel in the world Sky 262) I decided to make bacon and chocolate chip cookies. Yes, you heard right. I have a ‘thing’ for the unusual. I searched the Internet for a semi-easy recipe and set about my sweet and salty combination. Now, the recipe did not state whether to use smoked or unsmoked bacon, but I thought the smoked might have been pushing things a little too far. I fried my bacon to a nice crispness (although American bacon always seems so much crispier, why is that?). I let it sit for a while to cool and harden further, then broke it into chunks. 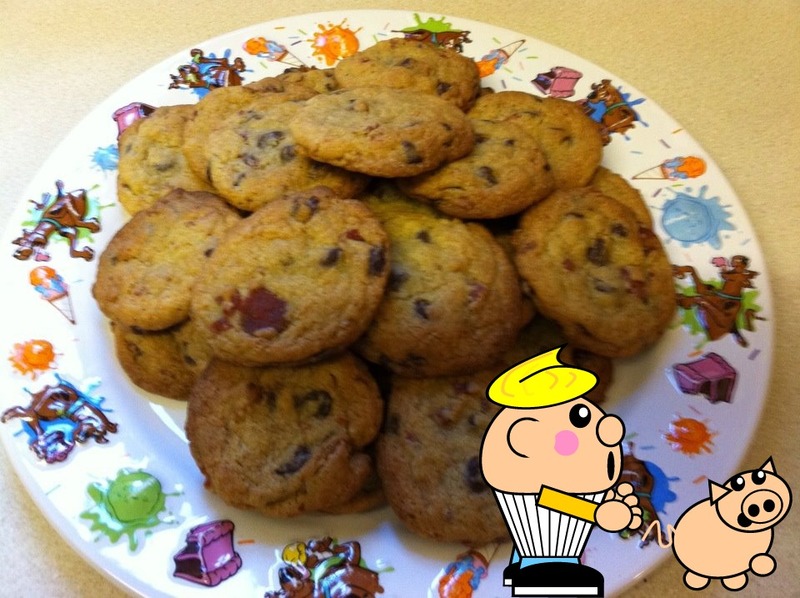 I made the cookie batter – it seemed like a decent enough mix. Then the bacon was added. I used my cookie scoop (one of those fancy ice cream scoops with the release mechanism) and dolloped the mounds of pig meat and choc chips onto the prepared baking sheet. In the oven they went. The aroma was unusual, not altogether unpleasant. And after the allotted time I removed them and let them sit for a while. I tried one, and it wasn’t tooo bad I thought. I then spilt them into batches, some for my partner, my work colleagues and my friend Claire who I was visiting for dinner the next night – ‘Don’t make dessert’ I said, ‘I’ve baked’. Claire was overjoyed, but then I hadn’t told her what I’d made. David, my better half, thought they were so-so. Not awful, not brilliant either. Work colleagues were polite. The crowd was divided. My immediate office felt they were ‘okay’ but then they had to eat them in front of me! The room next door could not finish them but no one told me until after! Then on to Claire’s for dinner. The look of sheer disappointment on her face was palpable! She tried them to be fair, but she felt violated in some way – her beloved chocolate chip cookies with an added hog protein were not to her liking. Sweetza - or the fake-out take-out!